Titan International has added two new sizes to its versatile Goodyear Rawhide tire lineup. The new 26×11-14 and 26×9-14 sizes are the largest available in the Rawhide Grip tread pattern. The Goodyear Rawhide Grip design offers excellent self-cleaning action and aggressive bite for additional traction, thanks to a high void-to-lug ratio, claw-shaped tread pattern and deep ¾-inch lugs. The larger 14-inch wheel size adds increased stability and taller suspension, and is an ideal choice for sandy or boggy terrain. This latest size addition rounds out an already robust offering from the Goodyear Rawhide family, which now includes more than 20 sizes and styles, available in long-bar, short-bar and claw-shaped tread patterns to meet the demands of any off-road adventure. 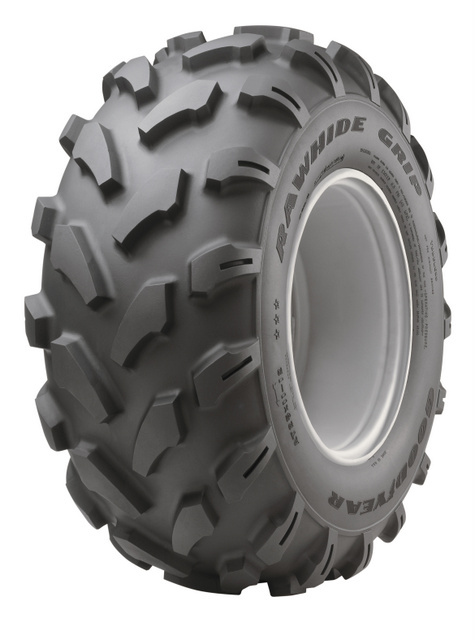 Please visit the Titan catalog website at http://www.titanstore.com/select_catalog/ to see the full lineup of Titan and Goodyear ATV and UTV tires or call 1.800.USA.BEAR to place an order.